For the last few days I have been looking at these cookie cutters admiring the shapes and the playfulness of the seven cutters: pirate, sailboat, octopus, crab, shark, seashell, and turtle. 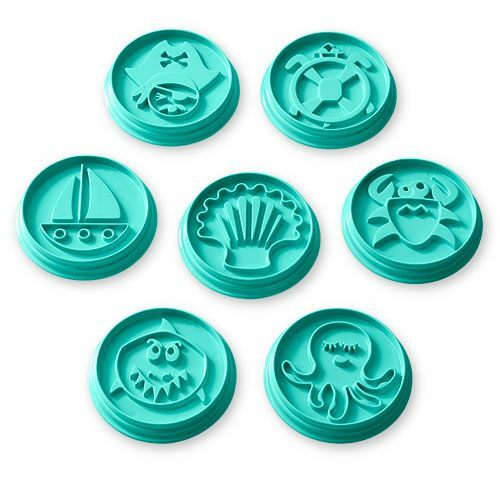 These 3 ½” diameter cutters make the cutest 3” cookies. Not only are they dishwasher safe but they snap together for easy storage. What I love about these cookie cutters is that each one is different and each has a different story to tell about the sea. You can use them with children to tell different stories about the sea and the different gifts each brings to the world and the environment. They provide a great way to teach about these sea animals, about life on the sea and explore the myths and facts about being a pirate. What I also love is that they remind me to value the diversity of those in my community. When we focus on each other’s gifts, we make room at the Welcome Table for all of humanity and by snapping together we also make sure none of us get lost. We stay connected and protective of the bonds we share, despite our differences. The act of snapping together reminds me of the amazing sense of family I have experienced since becoming a consultant. I am surrounded by a wide diversity of people I would have never met had it not been for Pampered Chef. We may individually seem like an eclectic group, but when one of us is in need, we all come together as a community to help each other through. If you want to add this set of cookie cutters to your collection, visit pamperedchef.biz/sharonjacobson or if you want to experience that feeling of family, consider joining my team this month when you can do so for as little as $39 this month only. Any questions, just ask.